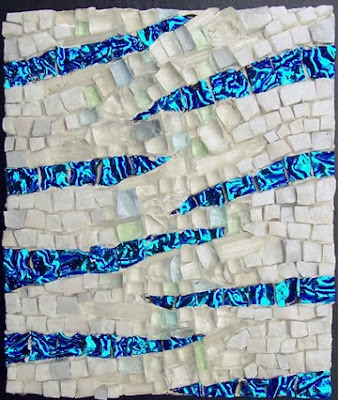 Margo Anton's Mosaic a Day: "Encroaching"
Not entirely sure what I think of this one. I think it actually has ended up looking like two ideas or two mosaics stuck together. The dichro is a little overwhelming--I think that if I had used silver gold in those sections, and in a much narrower fashion, the effect would have been more what I was going for.